I wish you a sunny Tuesday morning! 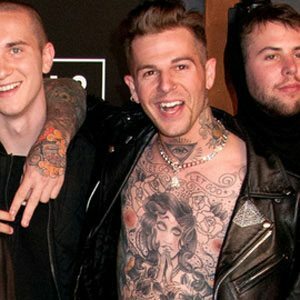 Let’s have a look at the alternative music scene today and celebrate the birthday of Jesse James Rutherford. Lead singer for the California indie band The Neighbourhood. Their hit single “Sweater Weather” reached number one on Billboard’s alternative chart in June 2013. He is joined in The Neighbourhood by guitarists Jeremy Freedman and Zach Abels, bassist Mikey Margott and drummer Brandon Fried. He acted when he was younger, playing Daniel on The Young and the Restless. He also appeared in such productions as Life or Something Like It, Ted Bundy and Dickie Roberts: Former Child Star. His was raised in Newberry Park, California. In 2015 he began dating Devon Carlson whom he was friends with prior to their romantic relationship. He impersonated Elvis Presley and NSYNC in talent shows. Here[ s their actual hit “Scary Love” 2018.
which reached already 20 Mio. video views on YouTube. I wish you a successful Tuesday and come back very soon with the next story about fashion & music.